Last night I got to experience an annual event which historically has become a master reset to my heart, mind, and soul for the past nine years. I went to see Amma (www.amma.org). Amma means Mother. She gives unconditional love & support. 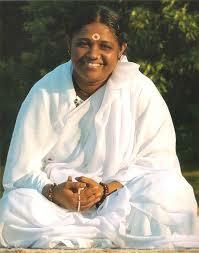 She embodies and teaches the devotional or bhakti aspect of the practice of yoga. It is through pure devotion that one begins to realize a greater oneness in our world I suspect because it takes us out of ourselves and into the Self. Bhakti Yoga shows us that there’s something much more than simply our individual or sometimes selfish interests because it connects us to the feelings of the heart. It is challenging or rather almost impossible I would say for the heart to mislead the mind because the heart simply exists and beats unconditionally until it is time for us to give up our bodies whereas the mind and body has the ability to twist, bend, and contort an idea or flesh which supports our personal level of comfort, status, our story. The heart, being dedicated to one main task is too busy and has no time for BS which is why we can trust our heart, it is being true AND present. Bhakti yoga is accessible to everyone because it deals primarily with the heart as opposed to the body through asana or the mind through studying the sacred texts. Sometimes we don’t have full control or understanding of either our bodies or our minds. Bhakti yoga however is more challenging for some because it forces or confronts us with having to connect deeply and to truly see and feel with our hearts – intensive work not for those faint of, you guessed it, heart. I am always inspired by great women in my life because they are able to show me strength in connecting with their heart and in many ways it has given me the permission or instruction to make a similar connection and deeper relationship and acceptance within my own heart and by extension, the world around me. In years’ past, I have often shared my experience of Amma with the love of my life. To be able to share an experience such as Hers with the love of your life is truly a rare gift because I’ve been able to experience a deeper level of inspiration, dedication, intimacy, and devotion to my Love which has brought us closer together on an even greater level – we were building upon our heart connection to form a stronger bond. This year was different for me. No longer did I have a wife nor did I have a beautiful girlfriend to share in the experience, a relationship which sadly came to a painful close most recently. There I sat, seemingly all ‘alone’ with loads of devotees around me. I was mostly still through the night, sitting silently with my eyes fixed on Amma alone. As I sat there lamenting with a sad heart my own personal story involving a very deep and painful heartbreak and my major mistakes and missteps in life, I was also able to feel the light from my heart starting to shine and pour forth toward Amma as if she were consciously drawing it out of me toward Her. No longer was it my heart alone feeling sorry for itself, it was Her heart, a Universal Heart, refusing to only be sad. To watch her embracing so many and to witness the effects of Her Love on each of her devotees has always been a mesmerizing and inspiring experience for me then and now. She has done so much good in the world, I will leave it to you to read about her on the link I supplied above. In studying her work, I am able to see the transcendental value of our own personal story more toward a global/universal story. Instead of my heart, it is One Heart. When feeling from the heart from a universal perspective, all is well in the universe because it is what it is – we are only a small part of it. When I connect with my own heart, I presently feel a lot of pain and heartbreak since this is not what I want. Do I opt to feel one exclusive of the other? Do I ignore the painful and only see/feel the Bliss? I’ll do neither actually, I will feel them both and I will see this as a transitory period to harmonize my individual sense of self toward a cosmic or universal sense of Self. We will always be in the process of becoming. We are being here and now because of our hearts. Though I can logically think and read and study about Yoga and shape my body, it was Amma who actually allowed me to truly FEEL what yoga is – universal and loving acceptance of all that is. This is the union known as Yoga. I cried so much last night, more than I have in quite some time, and in public no less. I usually have chosen to express my pain and sadness privately at home – after all I was raised in a time when it was emasculating for a man to be seen crying or displaying any sort of tender emotion in public. Some of it was for my poor little breaking heart and my state of missing my woman in my life and all the regular thoughts and feelings that come during a break-up. Most of my tears however were dedicated towards the realization and gratitude that we can all inspire and be as great as this one woman that we call Amma – The embodied Divine feminine form. Whenever I’m around Amma I sometimes can see my negative tendencies loud and clear, but I’m not harsh on myself about it as I might normally be. I’m interested and glad to understand myself a little better and know I’m human like everyone else. Amma gave me a mantra which I chanted every day for six months and saw serious positive changes – they all stemmed from honouring myself and others. I don’t think anybody has ever positively impacted me more than Amma.